Third walk. Passau again: I wasn’t hungry in the evening. So I decided to take a walk instead of going into a restaurant with other people. 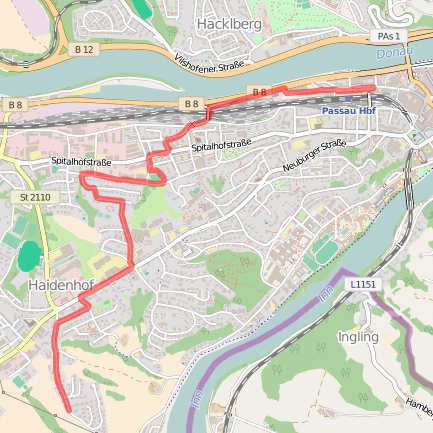 This time I started at Passau’s central station. Because of a turnaround just at the beginning, I didn’t walk straight into the old city center but in the west end of the city. It wasn’t that late in the evening but there wasn’t anybody around. That’s why I felt really uncomfortable after a while. But because I really wanted to fulfill the 20 iterations – my standard for a pattern walk since I reached my home on my first walk after 20 iterations again – I walked further on… and walked… and walked… However, as houses stopped to be on my right hand side and a field occurred instead of them I decided to stop my walk. Later on, back in the city, I joined my colleagues for a drink.